Nobody likes to admit they have a problem. I suppose it’s human nature, or at least in the world of sales part of the inherent optimism sales people must have to thrive. Individually and organizationally, we don’t like to admit we have problems for a number of reasons. Admitting it brings a huge amount of attention, much of it unwanted. People want the problem fixed—eliminated! Sometimes, they offer to help. In any case, admitting that we have problems shines a bright light, creating great discomfort for us. Did we do something wrong? Did we make an error? What are we doing to solve the problem? How quickly can it be solved? What are the consequences of not addressing it? Are you the right person to solve the problem? Too often, in making the problem visible, unproductive behaviors occur. Instead of trying to understand the problem and fix it, we focus on assigning blame. Some one must be at fault. Something must have gone wrong. Someone must have made a mistake. Assigning blame doesn’t solve problems. We learn nothing by assigning blame, and we divert critical attention and resources from solving problems. But our tendency to assign blame, creates a more destructive, but understandable, set of behaviors. We stop admitting a problem exists, we hide the problem and we hide out. Sometimes, we fool ourselves into thinking the problem will go away, but usually it gets worse. It reaches a point where we can no longer hide out. The problem continues to grow, it is visible to everyone–our managers, executive management, our customers, our competitors, our shareholders, the community. Hiding out, avoiding admitting there is a problem, admitting that we may have erred, not getting, help only makes things worse, the problem gets bigger. The time and resources needed to solve the problem get bigger, the impact of the problem gets bigger. How we think about problems and how we deal with them is largely a matter of our mindset. Those with fixed mindsets tend to focus on assigning blame. Avoidance behaviors start to set in, risk taking declines, learning declines. A strange thing happens, the same problems start recurring, all while new problems arise. Over the long term growth, personal or organizational, stalls, sometimes to the point of failure. On the other hand, those individuals and organizations having growth mindsets approach problems differently. They recognize problems are part of any growth process. They seek to learn from the problems and grow. They know that problems are a natural part of individual and organizational growth. They recognize that blame and avoidance aren’t constructive in addressing the problems and moving forward. It turns out, our ability to successfully deal with problems is, largely, attributable to mindset. Both individually and organizationally. 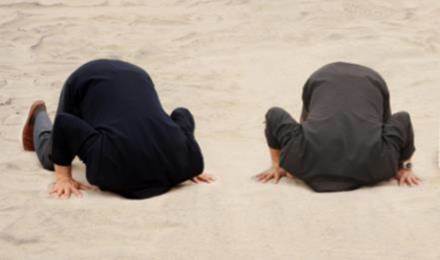 Are you continuing to bury your head in the sand? Are you quickly identifying problems, owning up to them, getting help, learning, and moving forward? As a leader, do you encourage openness in your team about identifying problems, seeking help, learning and growing? As an executive management team, are you challenging yourselves and everyone in the organization to identify problems and opportunities, to surface them, to learn and grow? Are You Guilty Of Picking Things Apart? Looking For Trouble Or Letting It Find You?